What is a fatty acid, and what is the difference between saturated and unsaturated fats? Fatty acids are long, organic molecules that contain a carboxylic acid functional group at one end (see the picture below) and a long, nonpolar tail at the other end. They are an important source of energy in the body because they can be metabolized to generate ATP, which the body uses as fuel. When you’re looking at the nutrition information on your food, the concept of saturated versus unsaturated fats can be understood by looking at the structure of a fatty acid. Saturated fats are those that contain only single bonds connecting each carbon atom in the chain. Recall that double and triple bonds are called units of unsaturation. Unsaturated fats are any fats that do have units of unsaturation, or, in other words, that do have double bonds between some of the carbons in the chain. All fats are either saturated (top illustration) or unsaturated (bottom illustration). You might ask then, what is this “trans fat” everyone talks about in foods? First we should point out that most of the double bonds in unsaturated fats are in the cis conformation (where both carbon substituents are on the same side) in nature. 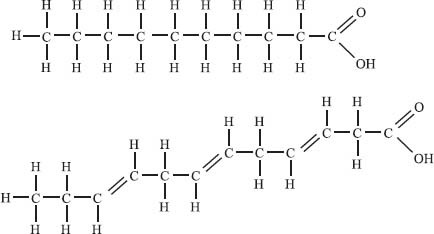 Trans fats are fats that have had hydrogen artificially added, which can result in unsaturated fats with a trans conformation about the double bond. There is evidence that these trans fats can be more harmful to your health than other fats. 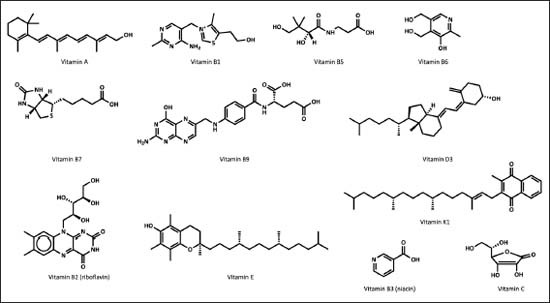 The structures of a sampling of vitamin molecules.